The Tidal Basin- The Tidal Basin located near the Jefferson Memorial have a great display of cherry blossoms every year during the springs time. There are over 3,000 cherry blossom trees which were once sent out to United States by Japan in the year 1912. Make sure you arrive early as it becomes crowded very soon. Hains Point- The Hains Point on East Potomac Park is over 300 acre peninsula located between the Washington Channel and the Potomac River towards the south side of the Tidal Basin. It is famous for its terrific views of the cherry blossom trees. The parking is limited in the park, so consider taking public transport to reach this place. National Arboretum- The National Arboretum in northeast Washington also offers over 75 different cherry trees which are well known for its beautiful azalea and rhododendron displays. Macon in Georgia called themselves as “Cherry Blossom Capital of the World.” It offers over 300,000 Yoshino cherry trees. Every year they held a 10-day International Cherry Blossom Festival. Mount Namsan– The streets in Mount Namsan looks beautiful when it is lined with beautiful pink Cherry blossom trees. Children’s Grand Park– It offers over 1,000 cherry blossom trees that literally lit up at night. Yeouido Cherry Blossom Festival– The festival happens every year in April. Huge numbers of people gather here to enjoy this week long festival. 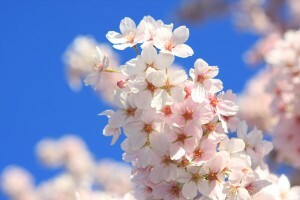 This year it falls on April 12 -18 (2013).You will get best view of cherry blossom near the National Assembly Building. Apart from the blossoms there is a small firework show during the night. Cheongpunghoban Cherry Blossom Festival– The Cheongpunghoban festival takes place on the Cheongpungho Lake all along the road side which offers great view of cherry blossom during the month of April. This year dates are from April 19-21st (2013). They conduct various other shows and concerts apart from the blossoms at the venue. After D.C San Francisco’s Japantown Cherry Blossoms are most popular in United States and also second largest cherry blossom of United States after D.C. Huge number of people gather here to witness the beautiful view of the cherry trees. Apart from the amazing view, there are food booths, Parade, cultural performances, martial arts, and much more. Matsumae – The Island of Hokkaido which is popularly known for its 17th century Matsume Castle also offers over 10,000 of sakura trees with 250 different varieties of cherry trees. Kanazawa – Located in northwest Tokyo, the Kanazawa city offers great view of cherry blossom in mid April. It is a beautiful modern city with many attractions like Kanazawa Castle and Kenrokuen. Kenrokuen is a beautiful garden which offers beautiful view of cherry blossoms in late April.